Most architects’ goal today is to optimize natural light in their buildings and houses so artificial lighting is rarely required during the day. But what are the best artificial lights for nighttime and for the transition from daylight to sunset and from night to dawn? To answer that question, you have to understand what comprises natural light. Natural light from the sun, diffused by the atmosphere, is known as full-spectrum light. Full spectrum means the light is a combination of different wavelengths from ultraviolet (UV) to infrared (IF). Humans, most animals, and plants require full-spectrum light from the sun for health and happiness. This natural light improves mood and productivity and reduces eye strain. The color temperature of daylight, measured on the Kelvin scale, is 5000K to 6000K. Higher Kelvin numbers correspond to cooler, bluer, and greener light. Office and work lighting is often in this color range. But optimal residential lighting has different requirements. Artificial light in the dawn, dusk, and evening needs to be much warmer than work or daylighting. One reason for using warmer color temperatures in homes is that amber-colored light is less disruptive to our circadian rhythms, the powerful biological clock that affects our sleeping and eating patterns as well as core body temperature, brain-wave activity, hormone production, cell regeneration, and other biological activities. Consider just our sleeping pattern. Blue and green wavelengths disrupt melatonin production—hence the many recommendations for removing “blue light” in bedrooms. Lower-K lighting in the amber range for evenings serves as important transitional light between bright, pure daylight and the full darkness of an ideal sleeping situation. The old incandescent bulbs had a color temperature around 2700K, or what is thought of as “warm white”—a flattering color temperature for human complexions. Although I now specify only LED bulbs, I still prefer 2700K for most light fixtures. For task lighting, such as home offices, kitchen work areas, and bathroom vanities, I specify about a 3000K bulb. When you’re choosing artificial light, always check the CRI—color rendering index—a lighting industry scale that rates how natural colors appear compared with a baseline of natural daylight. Higher CRI numbers mean truer color rendition. When you balance the warmer (redder orange) spectrum of 2700K to 3000K with a high CRI, colors will appear natural despite the lower color temperature. I use bulbs with a minimum CRI of 90. The current LED world is a bit like the Wild West. Manufacturers are scrambling to come up with a consistent way to designate bulbs so that designers will be able to compare apples to apples. We’re not quite there yet. While inferior-quality bulbs can have the same K and CRI designations as superior ones, they often give off inaccurate colors and light qualities. Also, inferior LED bulbs are prone to fail in a very short time. For residential projects, I recommend using a bulb brand from one manufacturer you trust and using it for the entire home. If you must use more than one brand, use only one throughout each room. 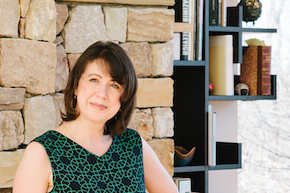 Arielle Condoret Schechter, AIA, is a registered architect based in Chapel Hill, N.C. She specializes in modernist, energy-efficient buildings and has expertise in net-zero passive houses.